With just [two] days until that deadline, many pieces have yet to fall into place for Arizona to finish its part of the agreement and join California and Nevada in endorsing the Drought Contingency Plan. The plan’s success or failure will turn on the actions of a few key players, including leaders of the Legislature, tribes, farmers, cities and the state’s water managers. If any of the main players pull out, the state’s carefully negotiated compromise could unravel and the plan could fall apart. Just such a breakdown seemed possible this week, when the Gila River Indian Community warned that the introduction of another water bill could kill the deal. If Arizona fails to sign the three-state Drought Contingency Plan, the federal government would be in charge of dictating water cutbacks. Water users that rely on the Central Arizona Project canal have the lowest priority among the three states on the lower river and would be first in line for cuts. If the federal government takes charge of deciding the reductions, that also might unleash a cascade of lawsuits. To finish the agreement, the state Legislature would need to pass a package of legislation making the deal possible and allowing for its signing. Whether that will happen before the deadline isn’t clear. House Speaker Rusty Bowers said this week that while lawmakers are working hard to get a deal done, meeting the deadline isn’t his chief priority. Burman has warned that if Arizona or any other state doesn’t sign on in time, the Interior Department will ask all seven states that rely on the river for recommendations on what the government should do to prevent reservoirs from continuing to fall. Supporters of the deal, including Gov. Doug Ducey and the state’s top water managers, say failing to act in time would put Lake Mead on course to decline more rapidly and would signal an inability to come up with water solutions within the state. Lawmakers received a first draft of the proposed legislation from Ducey’s office on Jan. 16. On Thursday [January 17, 2019], the Central Arizona Project board voted to support the package of legislation and a proposed resolution that would grant Department of Water Resources Director Tom Buschatzke the authority to sign the Drought Contingency Plan on Arizona’s behalf. The legislation is based on a plan that emerged from a series of meetings and negotiations over the past seven months. The plan focuses on spreading the water cutbacks among entities and lessening the economic blow for those with the lowest priority, providing “mitigation” water to farmers in central Arizona while paying compensation to other entities that would contribute. The proposed legislation includes several tweaks to state law to make the plan work. The Legislature is expected to take up the measures…possibly Tuesday [January 29, 2019], just two days before the federal government’s deadline. Bowers, R-Mesa, said he expects that the bills will be heard in the House Natural Resources, Energy and Water Committee on Tuesday, and that the House might suspend some procedural rules to expedite the measures. “The most important thing to me is to get the deal done right,” Bowers said in an interview with The Arizona Republic. If the Legislature takes a few extra days to pass the legislation, that would be at odds with Ducey’s emphatic calls for meeting the Jan. 31 deadline. But Bowers said “it takes time” for so many lawmakers to vet the issue. If lawmakers get behind the plan, it could sail through quickly. But it’s also possible that some groups and their allies in the Legislature could try to tack on unrelated water legislation, which might elicit opposition and derail the agreement. Arizona’s plan involves more than $100 million in funding pledges from Ducey’s administration and the Central Arizona Water Conservation District, which manages the CAP Canal. Much of the money would go toward paying for water from the Gila River Indian Community and the Colorado River Indian Tribes. Without the tribes’ participation, the deal wouldn’t work. But the Gila River Indian Community has warned that if certain proposals are pushed into the package at the last minute, that could kill the deal. For one thing, the Community’s representatives said earlier this month that they wouldn’t accept an “offset” proposal that would have given the CAP board discretion to potentially draw stored water out of Lake Mead. Another squabble erupted several days ago over a separate water bill sponsored by Bowers. He was referring to a 2017 ruling by the federal Ninth Circuit Court of Appeals, which found that a group of farmers in Safford gave up rights to Gila River water under the state’s water rights forfeiture law because they hadn’t diverted the water for more than five years. The Colorado River Indian Tribes divert water to a swath of farmlands along the river, growing crops including alfalfa, wheat and cotton. The Tribes have agreed to take 10,000 acres of farmland out of production for three years, leaving the fields dry and freeing up the water so that it can be kept in Lake Mead. In return, the tribes would receive $38 million, including $30 million from the state and $8 million contributed by non-profit groups. Chairman Dennis Patch said he thinks Arizona’s plan will benefit tribes and the state as a whole — in part because it would keep more water in the river and prevent it from drying up like other rivers in Arizona. He pointed to the history of the Gila River and the Santa Cruz River, which have been heavily drained over the past century by diversions and groundwater pumping. And he said if everyone insists on sticking to water rights they hold on paper, it could put the river’s reservoirs on course for a crash. Not everyone in the agriculture business in Arizona faces imminent water cutbacks. But farmers in Pinal County have the lowest priority and are in line for the biggest reductions in water deliveries. Arizona’s plan would lessen the economic blow for the farmers by providing them with a limited amount of “mitigation” water for the next three years. Agricultural irrigation districts in the county are seeking state and federal funding to pay for new wells and other infrastructure that would enable them to pump more groundwater. The CAP board has authorized $5 million, and Ducey has proposed an additional $5 million to help. But the Pinal farmers say they’re hoping for more state money to help with an application for a federal grant and get closer to the estimated $50 million it will take to drill wells, buy pumps and build other infrastructure to carry groundwater to their fields. To help them during the transition, the farmers have asked for “backstop” measures to ensure they’ll get a steady amount of Colorado River water for three years — even in the event of a more serious “tier 2” shortage. A deal with Tucson would make that possible but as a condition the city has requested other tweaks in the state’s groundwater law, which have been included in the package of legislation. Farmers in Pinal County produce crops including alfalfa, wheat, cotton and cantaloupes. Until recently, the growers had expected to receive Colorado River water until 2030 under the terms of a 2004 water settlement. They faced a decreasing schedule of water deliveries between now and 2030. Under the drought plan, those cutbacks will come much more quickly. In pressing for funding, the farmers have cited a University of Arizona economic study, which found that Pinal County ranks in the top 3 percent of all U.S. counties for total crop sales. The researchers said that in 2016 farms and related businesses contributed nearly $2.3 billion in total sales to the county’s economy. Arizona’s cities have lined up to call for swift passage of the drought plan, saying it’s critical for the economy. Brett Fleck, the association’s senior water policy analyst, examined the economic data and said all agriculture-related businesses in Pinal County represented about 0.2 percent of Arizona’s economy in 2016. The association has also disagreed with concerns voiced by the Home Builders Association of Central Arizona. Representatives of developers have called for a provision conditionally granting them a certain amount of water as a “backstop” for the first three years of a shortage. Officials in Phoenix and other cities have argued that’s unnecessary because the Gila River Indian Community has already agreed to a deal that would provide water for future development if the drought plan is signed. The governor and the state’s top water managers are campaigning to get the deal passed swiftly. During a budget briefing this week, Matt Gress, the governor’s director of strategic planning and budgeting, presented a chart showing two likely scenarios for Lake Mead: one with the Drought Contingency Plan or one without. Still, there wasn’t unanimous support for everything in the legislation among the 15-members of the Central Arizona Water Conservation District Board. Aside from the legislation, there are 15 related agreements between parties in Arizona that spell out details of the plan and that have yet to be signed. CAP General Manager Ted Cooke said he hopes the Legislature passes the resolution and the accompanying legislation in time to meet the deadline. He said it’s doubtful that the 15 other agreements will be signed by Jan. 31. 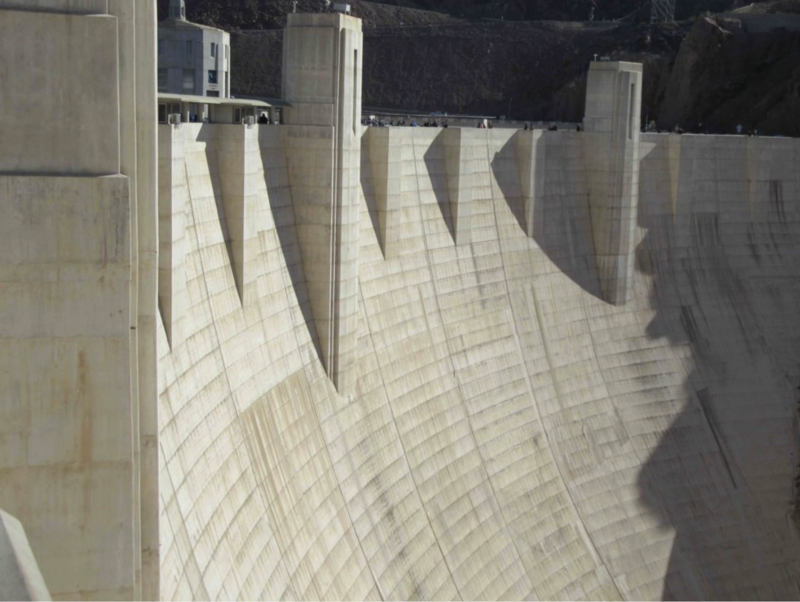 The federal Bureau of Reclamation, which manages reservoirs on the Colorado River, has said the deadline stands. If the parties haven’t finished their work to complete the Drought Contingency Plan by Jan. 31, the Interior Department plans to publish a notice in the Federal Register. Aaron said if this occurs, the states will have 30 days to submit recommendations and the Interior Department will consider the input in deciding on a course of action before August. Under existing guidelines, Arizona would be first hit and hardest if Lake Mead, on the state’s border with Nevada, falls below 1,075 feet. Arizona has the lowest priority rights to the river. If the drought plan is approved, cuts would be spread more widely and eventually loop in California. n California, the Metropolitan Water District, a major user of Colorado River water, is pumping more to ensure the 500,000 acre-feet of water it has stored behind Lake Mead won’t be stranded if the reservoir [is operated under the 2007 shortage sharing guidelines].